The Village Inn strives to be a family friendly environment. Each individually owned room has a unique personality and floor-plan; pay attention to the details/amenities when booking your condo. Thank you for using our self-service, online booking system! Reserve up to 150 days in advance. CHECK IN is from 4PM - 8PM. We expect our guests to call ahead if they plan to arrive after 8pm. CHECK OUT is by 11AM. We expect our guests to take out their garbage and wash/dry dishes. Pool access is restricted to registered guests sleeping in the unit you have reserved. Violations subject to a $250 fee. Children under the age of 13 must be accompanied by a supervising adult in your party at all times. Please adhere to all posted pool rules, including: *No Glass in Pool Area, *No Beer Boxes or Coolers, *No Diving. Pool will be heated to 100 degrees when the lifts are running. 85 degrees in the summer. 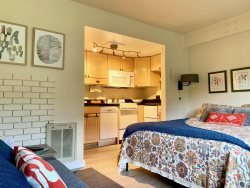 Open and heated at management discretion May-Dec.
We are happy to refer guests to fun and pet-friendly lodging and dog boarding options nearby. Rental guests are not allowed to bring pets onto the Village Inn premises. This includes our units, parking lot, balconies, decks, pathways, hallways and office entry areas. Violations of this policy are subject to a $250 fee and/or eviction from the Village Inn premises. Some owners do bring pets, so if you have serious pet allergies, please email so we can match you to a pet-free unit. If you must smoke, please do so 50 feet from any structure. Dispose of butts properly in garbage bins provided for all buildings. No Marijuana because we are on USFS property and Federal Law applies to the Village Inn premises. Even though Washington Law allows marijuana use, Federal Law does not. Be aware of the winter surroundings and hazards caused by snow and cold weather. Beware of icy footing, especially when going up and down the stairs and walking in the parking area. While every effort is made by the Village Inn to reduce these hazards, slippery conditions are a part of the mountain lifestyle. Do not walk in the "drip line". If icicles are overhead, they can fall. Ice builds up and is unavoidable in certain conditions, despite the best efforts of our staff to remove hazards. Do not allow children to play in the parking area. The Snow Play area is our front lawn and is specified on our map. Absolutely no tunneling off pathways. Please be aware that any tunneling is a dangerous activity. If you need to cancel within 48 hours of booking, please email the office. The Village Inn recommends you safeguard your purchase with travel insurance such as CSA or another agency. The Village Inn is a place where families come to enjoy the great outdoors. Please respect your fellow guests by adhering to our quiet hours 10:00PM to 6:00AM. During winter season you may hear snow equipment running at all hours. The walls are thin. The rooms are small and efficient. Please match your expectations and treat the privately owned rooms and the amenities provided by the owners with respect. Families may prefer to book two condo units across the hall from one another to be more comfortable. Smoking, beer boxes and coolers are not allowed in the pool. Thank you for keeping our pool environment comfortable for all guests. There is no WIFI on site, because bandwidth is extremely limited up at the pass. AT&T and US Cellular get excellent reception at The Village Inn. AT&T does not get reception in Packwood. Verizon does not get reception at The Village Inn. Verizon gets excellent reception in Packwood and at the top of the ski hill.